My stomach turns every time I watch a video of guys riding that bridge. Congratulations! At least you had good weather. Which made the bridge crossing turn my stomach just a little bit. Awesome, just awesome. Waiting impatiently for more! The Felix Wright Kuanda Mullet Dance that is an adaptation of the Pete Berry Botty Dance. 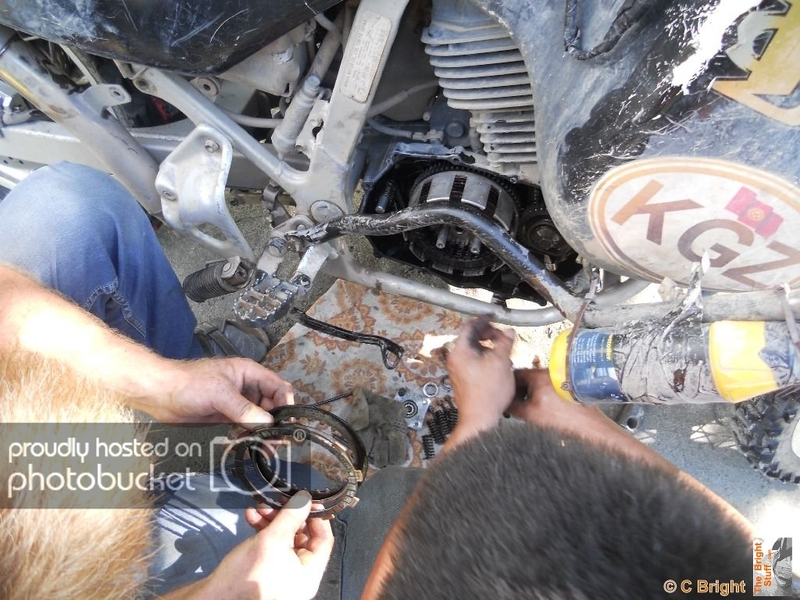 Pete rode UK to Magadan and back on an Xr400 with barely a hitch. On my aborted Mark I attempt at the BAM trip shortly before it retired hurt, we were out eating and drinking in Novo Uoyan. I went to bed and the others carried on partying, including Pete dancing with some local women who were apparently less than impressed with him wiggling his bottom. Since the Sochi Olympics we know Putin's view on gays. These women seemed to (wrongly) think that Pete was of that persuasion too and expressed their displeasure. Maybe Adam Lewis can help to fill in the details and adjudicate if Pete's or Felix's dance is better! ... before kneeling down as if to say "We are not worthy. He must be the messiah..."
There were many railway bridges to cross. This was the only guarded one until Olyokma. At one, I met a train half way! More about that in the next chapter! The railway is your friend and navigator and if the sh!te hits the fan, your get out of jail free card. Like me on the Mark I and Joe after his mishap. Hello to Montana my septic friend . Hope you're well and looking forward to the summer. When you're enjoying it, it's easy to take pics and vids. It also helps that there are so many photo ops. Remember the Philosopher of Garaj Mahal? I get the shudders when I watch the vid, and I'm the one who rode it! The height, the speed of the water, the temperature of the water and wearing full riding gear: None of these are helpful if you were to ride off the bridge! Not quite in sequence chronologically, but still topical. It may not be totally clear from my ride report, but the Mark II (BMW X Challenge) did make it to Magadan and back to the UK: In November 2013. Here's a picture of it and Felix's bike in the back of my van on a mammoth drive form Rotterdam to Yorkshire in November 2013. 2 weeks ago (late April 2014), the Mark I arrived in the UK too. 4 and a half months late! The pictures below are taken by Darren Mitchell in my employer's groundsman's lawnmower shed where Darren helped me hugely get it back on its wheels and into van and home. In a Eurotunnel carriage sous la marche at midnight. Mark I Transalp: Arrived mid April 2014, box opened the other day: The bike came in a container from Mongolia. Nearly half a year late! If you ever need to ship anything to or from Mongolia, I can advise an agent to most definitely avoid! thank you for sharing. very nice adventure ride report. Good eating and drinking with you in Bucharest last month. Many thanks for showing me around. 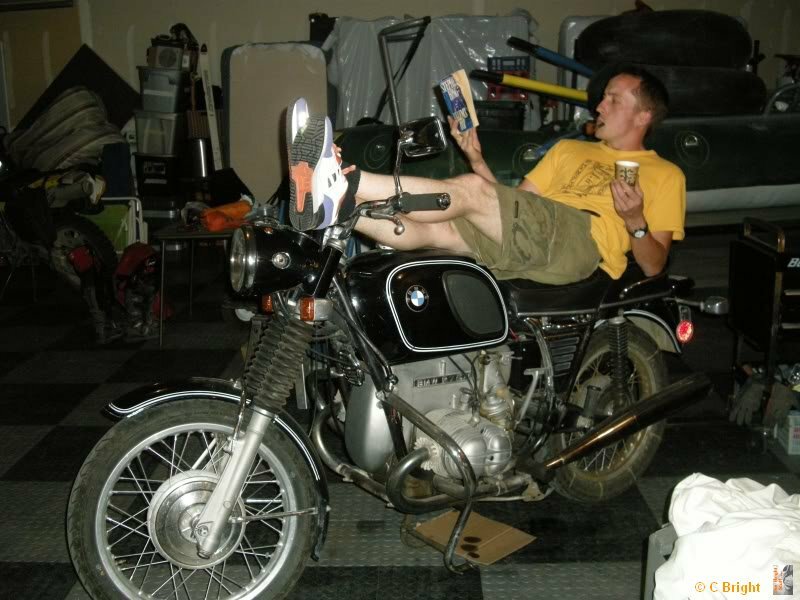 There are lots of places that are much more fun on a light 650 single, compared to a shed like a big twin cylinder bike. That's why I bought the borrowed XC in this story. I now use my Transalps/Africa Twin for road touring and easy gravel. Why not keep the 990 for the easy stuff and also buy a 690 for the fun stuff? After the little shipping story, the RR is back on track. Apologies if some of the town names are incorrect and the pics in the incorrect chronological order. I had 2 cameras and a helmet cam. Felix also has 2 cameras, so sorting out what goes where, wasn't easy. Top stuff, not :-( Good fun in a perverse sort of way! Yep, you've guessed it. That white stuff over my left shoulder is ice. Memorial to a driver who lost his life at the river in the following video. We saw quite a few of these on our trip. Vodka consumption might have played a part in some victims' road traffic incident demise. Even Evel Knievel might have struggled across this one! The video to go with the pictures above and below. I remember the name Hani, because we stopped there to get some supplies and the (drunk) bloke wouldn't leave us alone and insisted on showing us his mobile phone address book entry under the name of one Walter Colebatch ! Dude, you made quite an impression on this chap! He thought you were the messiah! One careful lady owner. Never been offroad. We had ridden along the embankment for a little while. There is usually quite a bit of space, because it was built to take 2 sets of parallel tracks, but only one set was ever laid. The railway bridges however are only wide enough for 1 pair of tracks. Felix is up ahead and has crossed already. Where he is, the track curves to the left behind some trees and bushes. I stop and turn round to see if nothing is coming from behind me. The coast is clear, but I do notice a green signal light that would be seen by any oncoming train driver I'm about a third of the way along riding the bridge-walkway with my right pannier scraping the railing and the left one over the sleepers. Felix is gesticulating wildly! It didn't take a genius to work out why. I think I mouthed to myself "Yeh, I've seen it". So we get off the bridge and decide to head down the embankment and back to the main trail. As Adam said in post #74 at Mongolia to Magadan: Any which (the hard) way - Page 5 - ADVrider , "There's no such thing as an innocuous looking puddle in Siberia eh! " He's not wrong! Felix takes the right hand rut and just makes it. I think I'll take the left. Big mistake! Are you enjoying this Mr Bright? No, not exactly. I was particularly weary of toasting another clutch (we didn't have a spare XC one with us), so made sure the bike was completely free before Felix gave me a tow. He apologises for me flying through the air and falling when the bike launched forwards. I was very happy and really didn't give a toss. *** Am I the first person to ride a bike with Magadan panniers to Magadan?!! Sorry I digress! Not even a bit upset? I wasn't even the first Magadan pannier bike to Magadan in 2013! That honour went to Adam Lewis/ Mr Short Way Round. I'm glad you liked here in Bucharest.